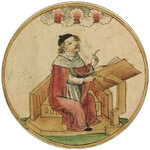 Calculations at a frame. 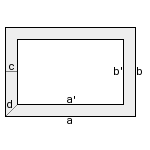 A frame is a rectangle, from which a smaller rectangle is removed centrally, whose length and width are an equal value shorter than that of the larger one. Enter the frame thickness, one length and one width. Choose the number of decimal places and click Calculate. For a frame with a height, see hollow cuboid. Thickness, lengths, widths, diagonal and perimeter have the same unit (e.g. meter), the area has this unit squared (e.g. square meter).